What do Flying squirrels look like? In the wildlife industry we call them flyers and see them on a regular basis. These neat little creatures are nocturnal and many don't even know they exist. Flyers are in their nesting areas during the day so is not uncommon to inspect an attic infested with such animals and see them peeking right back at you. The southern flying squirrel is easily distinguished from gray squirrels by its smaller size and by its gliding membrane, a fold of skin that extends from the wrist of the front leg to the ankle of the hind leg. When the front and hind legs are extended, the membrane forms a wing-like gliding surface. The furred, broad and horizontally flattened tail serves as a rudder and stabilizer during glides. The eyes are noticeably large, an adaptation for its nocturnal habits. The ears are more prominent than in other tree squirrels. Whiskers are also prominent. 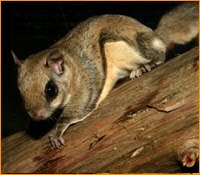 Southern flying squirrels are quite small. Adults usually are nine to 10 inches long including the tail, and they weigh between two and four ounces. Their fur is soft, silky and moderately long. The upper body is grayish to brownish in color, and the under parts are creamy white. The eyes are surrounded by a black ring, and a black border extends along the edge of the gliding membrane. *Flyers often nest with high populations and can cause destruction and unhealthy situations in an attic. For more info. on attic cleanouts click here. Is a bat loose in your house?